The trail to the Great Camp Santanoni is a fantastic trail for a great cross-country ski trip. It's 5.0 miles one way to the Great Camp. A ten mile loop is enough for most people, but the destination is well worth it. 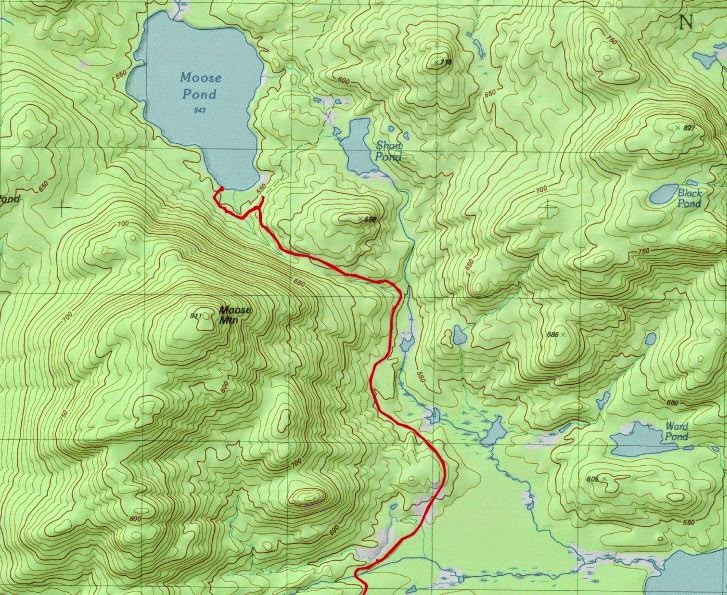 Another option, albeit much longer, is the 14 mile roundtrip cross-country ski trip to Moose Pond. 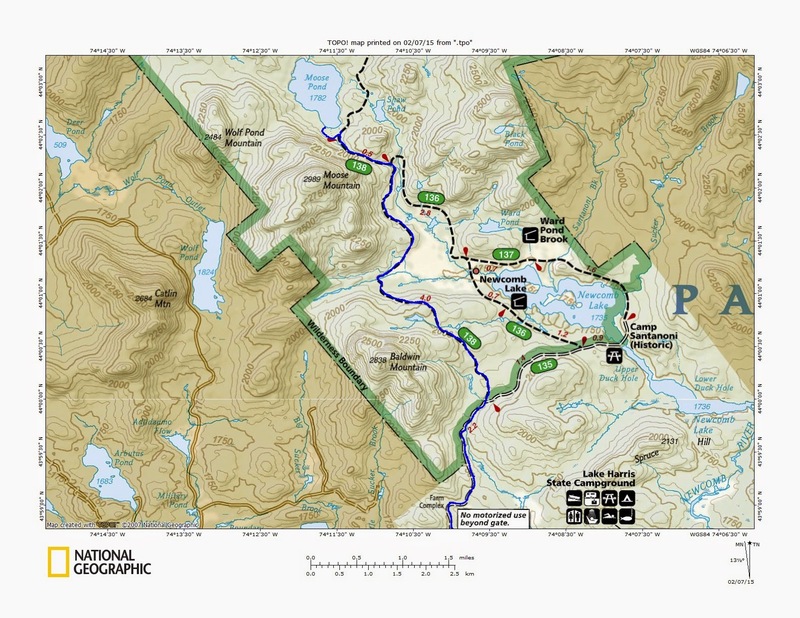 Both trips share the same trailhead; the parking lot for the Great Camp. 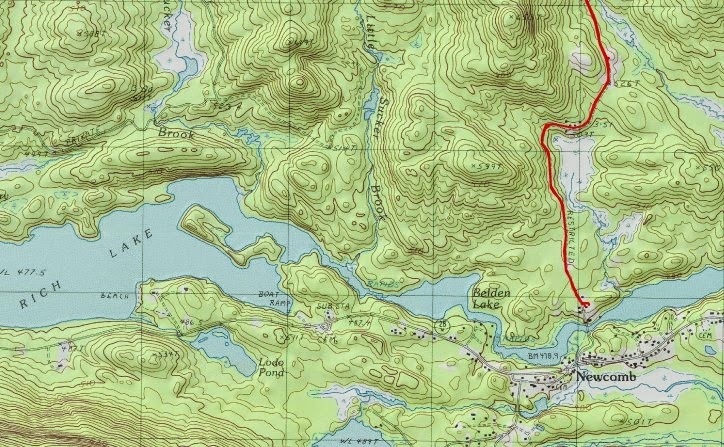 Both trips also share the first 2.2 miles, before the Moose Pond trail bears left. This was the option Leesa and I chose for today. We were greatly surprised when we arrived at 10 AM that there were 3 cars in the parking lot, netting 3 lone skiers headed for the Great Camp. This trail usually receives quite a bit of traffic. There was 4 inches of fresh snow on top of the previous trail, which made for a nice quiet, yet quick ski to the junction. Before the junction we passed 2 women heading in, and one man heading out. These were the 3 skiers we saw in the morning. As I expected when we reached the junction, the Moose Pond trail had to been broken out. This gave me the chance to break trail in a foot of powder and not get too far ahead of Leesa. Our dog Rev actually broke trail and she did a good job of it. The snow was deep enough that her belly was dragging in the snow. She didn't seem to mind. The Moose Pond Trail is actually a jeep road the entire length. It has been well cared for in terms of clearing blowdown. We had no issues as far as detouring around any fallen trees. Rev, coming back to check on us. Somebody wrote 4.7 on the sign, which is actually more accurate than the adjacent sign that says 4.5 miles. 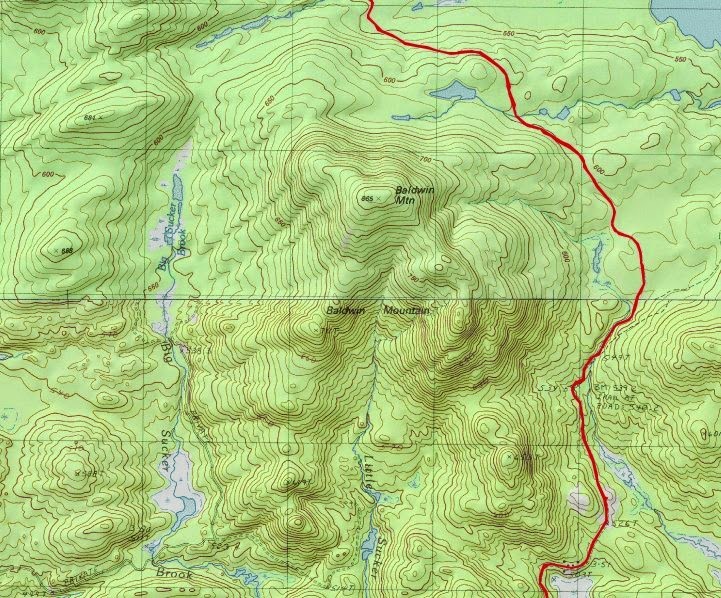 The route to Moose Pond is an easy grade the entire length, making it a great trail for a novice skier. The only issue is that the trail is often not been broken out, as was the case today. At the 6 mile mark, we reached the far end of the trail that goes back to Newcomb Lake. This trail had not been broken out either. We continued on towards Moose Pond. After another mile, we reached the final trail junction of our day. This was the junction where a left turn goes to Moose Pond campsites 1 & 2, while the right fork goes around the east side of Moose Pond. Leesa turned around at this point to get a head start on me for the trip back. I continued on the 0.3 miles to the campsites at the waters edge. There is a footpath branching right that leads past an outhouse to the campsites and the pond. Almost as bad as a "thunderbox". The door has broken off. Moose Pond. Visibility was poor since the snowfall rate was picking up. There wasn't much to see at the pond in winter with snow falling. I didn't ski out onto the lake since visibility was poor. I turned around at the campsites and headed back to catch up to Leesa. This is a typical shot of how easy and open the route is. At around the 5 mile mark on the way in, we had noticed lots of moose scrapings in a big open clearing area. I stopped on the way back to take a few pictures of them. I pieced together 3 maps to show the entire route.